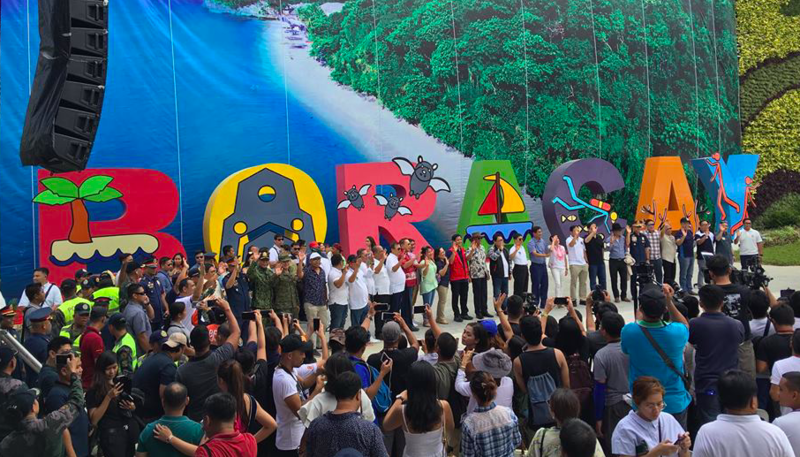 A new “selfie backdrop” unveiled on the newly opened island today. Visitors to the newly reopened Boracay will have to register at ‘tourist verification centres’ before boarding a boat to the island. The measure is among a slate of new rules and regulations to be imposed after the island’s six-month closure came to an end today. The strict verification and monitoring of tourists are aimed to prevent congestion on the island, which is now limited to 6,405 arrivals per day. At any given time, no more than 54,945 tourists are allowed on the island. Those that arrive at the quayside wanting to visit the island without a prior booking will be able to choose from a list of accommodation providers that have been confirmed as fully compliant with government requirements. 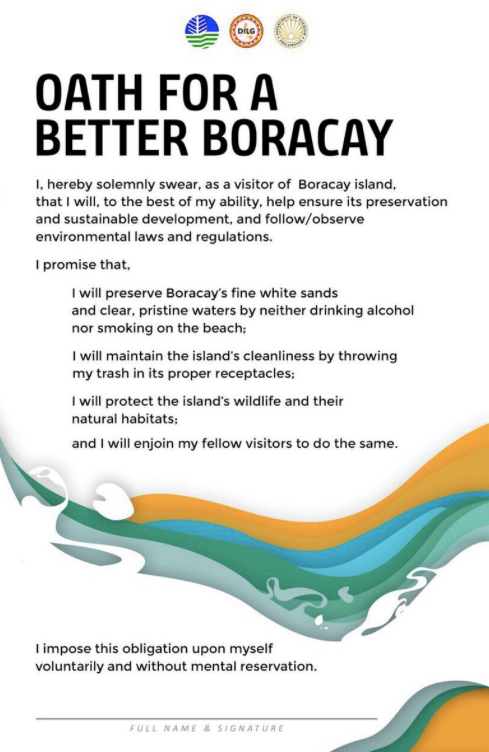 They will also have to sign an “oath” promising to maintain the cleanliness of the island. As we reported earlier this week, the Department of Tourism has compiled a list of the 157 establishments that are allowed to take bookings. In total, there are more than 400 hotels and guesthouses on the island, the majority of which will remain closed. Meanwhile, the police are deploying some 500 additional personnel equipped with new patrol vehicles. There will also be four modern jeepneys operated by Grab Philippines plying the island’s roads – many of which remain under construction. Rides are free until the end of the year, but will then cost up to 350 pesos for the Hop-on, Hop-off service. President Duterte ordered Boracay closed in an effort to curb overdevelopment and crack down on establishments violating environmental regulations. There has also been the suggestion that the island should have a month-long rest or “healing period” every year. Speaking at the opening today, Eduardo Año, secretary of the Department of the Interior and Local Government said: “Just like other beaches in other countries, they have been called rest or healing period,” he said.